Talentica believes in continuous learning and innovation. We the Talenticans have always been encouraged to undertake learning and experimenting with emerging technologies. With the same objective, we have setup an internal R&D group working on upcoming areas. Software defined networking (SDN) is one the areas where we are developing proficiency. As a part of SDN group, we are working on a measuring Hadoop Map Reduce shuffle phase network transfer and also possible traffic engineering solutions for optimizing shuffle phase network transfer. While working on the same, we encountered several challenges, this blog is highlighting solution to one the challenges we faced. 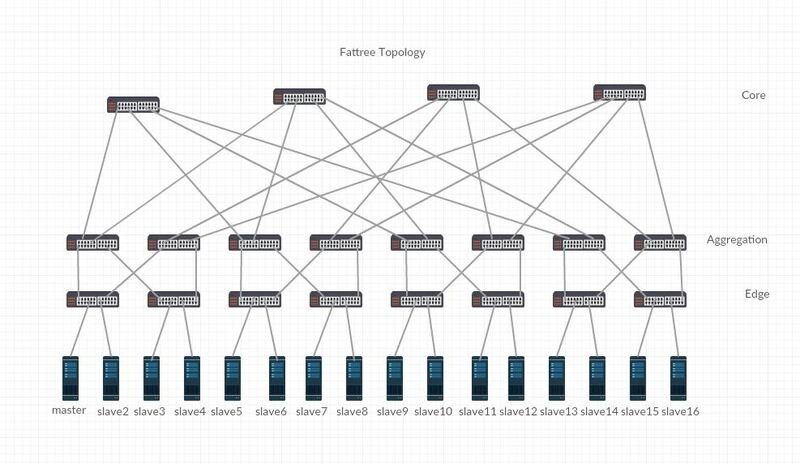 One of the primary requirements of our project was to set up a SDN-enabled fat tree topology using mininet python API. Mininet provides network isolation to the end hosts which it creates from base machine, but the file system and the processes of the base machine are shared. We wanted to have a complete isolation including the isolation of the processes and file system as well. In this post we explain how to replace mininet hosts with docker containers to ensure that the applications which we are running on the end hosts are completely isolated from each other. Install mininet natively from source using below commands. Install the latest version of docker using this guide. Install POX controller using this guide. We are using POX which is an OpenFlow based controller to install the forwarding paths on switches in the topology.We assume that you have successfully installed mininet, docker and POX controller on your base machine. In next steps we will create the topology. We need a docker image to instantiate docker containers. Pull a basic Ubuntu docker image from docker hub using below command. Download the source code fattree.py to create the topology from our git hub repository. We are using a custom class that spin-up docker container for every host. This article “Docker Container as Mininet Host” lists down all the methods to be implemented by the class, but the code doesn’t work with the latest version of docker. We modified this code as well to make it work with the latest docker engine (version 1.10.3). Referring the source code, “DockerHost” class creates and starts a docker host from the specified docker image. The DockerHost class is passed as a parameter to mininet API while creating the hosts. Mininet creates all the hosts which are docker containers started without any network or connection to default docker bridge, then it adds a network interface to host and host is connected to the edge switch to create topology. To enable ssh/ping on docker containers from the base machine, we need to create a virtual node in root network namespace and link the created node to one of the core switches in the topology. When the link has been established, topology network is connected with root namespace. Finally in routing table in base machine, add a static route to route traffic to docker hosts via root node interface. (Refer enableSSH method in our topology code). Run the source code using below command to create a fat tree topology as shown in Figure 1. We can see that sixteen docker containers are up and running. (Replace container1-name with the name of the container from you want to ping and container2-IP-address with the IP address of the container to you want to ping). We can also check that base machine is also able to ping all the docker containers by pinging the containers from base machine. In this post, we explained how we can use docker containers in a mininet topology. Using docker containers as mininet hosts is an advantage where we can simulate a network consisting of hosts capable of running application in isolation with each other. "In reply to Karol Bak and MonsieurWave, The error says invalid literal for int() with base 10: ''". It shows that ps_out is a null string as there is nothing within the quotes. This happens when the image pull from dockerhub is not successful. First, in fattree.py line 24, you need to replace "hadoop:latest" with any of the hadoop docker images present in the dockerhub. Second, you should also strip the extra quotes from ps_out using self.pid = int((ps_out.strip()).strip("\'")) in line 142. If the error still occurs, it probably means you gave an invalid docker image in line 24.". "Thanks for sharing the descriptive information on Docker tutorial. It’s really helpful to me since I'm taking Docker training. Keep doing the good work and if you are interested to know more on Docker, do check this Docker tutorial.:-https://www.youtube.com/watch?v=sYr4frA_1d8". "Hi! Thanks for your post! I am trying the network itself inside a Docker container and I keep getting the error ValueError: invalid literal for int() with base 10: '' for the line: `self.pid = int(ps_put)` Do you know a way to fix this?". "Hi! I still have problems with start your example. mininet@mininet-vm:~/mgr/topo/of_odl/topology$ sudo python fattree.py DEBUG:__main__:Class HugeTopo DEBUG:root:LV1 Create HugeTopo DEBUG:__main__:Class HugeTopo init DEBUG:__main__:Start create Core Layer Swich DEBUG:__main__:Create Core Layer DEBUG:__main__:Start create Agg Layer Swich DEBUG:__main__:Create Agg Layer DEBUG:__main__:Start create Edge Layer Swich DEBUG:__main__:Create Edge Layer DEBUG:__main__:Start create Host DEBUG:__main__:Create Host DEBUG:__main__:Create Core to Agg DEBUG:__main__:Create Agg to Edge DEBUG:__main__:Create Edge to Host DEBUG:root:LV1 Start Mininet *** Creating network *** Adding hosts: Removing any old host still running Error response from daemon: No such container: mininet-4001 Error response from daemon: No such container: mininet-4001 Start Docker Host ['docker', 'run', '--privileged', '-h', 'mn-4001', '--name=mininet-4001', '-di', "--net='none'", 'hadoop:latest', '/bin/bash'] Traceback (most recent call last): File "fattree.py", line 321, in createTopo() File "fattree.py", line 294, in createTopo net = Mininet(topo=topo, link=TCLink, controller=None, autoSetMacs = True) File "build/bdist.linux-x86_64/egg/mininet/net.py", line 172, in __init__ File "build/bdist.linux-x86_64/egg/mininet/net.py", line 444, in build File "build/bdist.linux-x86_64/egg/mininet/net.py", line 415, in buildFromTopo File "build/bdist.linux-x86_64/egg/mininet/net.py", line 224, in addHost File "fattree.py", line 32, in __init__ Host.__init__( self, name, **kwargs ) File "build/bdist.linux-x86_64/egg/mininet/node.py", line 106, in __init__ File "fattree.py", line 142, in startShell self.pid = int(ps_out) ValueError: invalid literal for int() with base 10: ''".